The Project Healing Waters Fly Fishing (PHWFF) – Quantico Program hosted the 3rd Annual Gray Whiskey River outing to the South Fork Shenandoah River, Sat., June 28. More than 23 Volunteer Guides, Warriors and family members from the Quantico and Fort Belvoir programs attended the all-day event near Rileyville, Va. 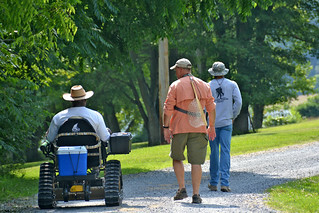 Participants fished on 300-400 yards of direct access to the Shenandoah River. The weather was sunny and warm. Fishing was a challenge but those who fished were able to land bluegill, crappie, small mouth bass, and chubs. All equipment was provided to the Warriors and family members. A homemade bag lunch was provided by PHWFF and dinner was prepared and donated by the Grays. This year’s event included (Army Col.) Greg Gadson, who, just the week prior, handed over garrison command of Fort Belvoir. Gadson was able to use his newly acquired Action Trackchair to access the river bank to fish.